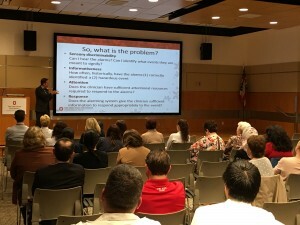 Our IDEA4PS Learning Lab Lecture Series provides learning opportunities on a range of patient safety topics. Learning lectures take place quarterly. Please check back for details on our next lecture. “Digital Hotspotting: Keeping Patients Safe in Real Time” was presented by Dr. Courtney Hebert on June 29, 2016. “Leveraging Crew Resource Management to Keep Patients Safe” was presented by Dr. Timothy Huerta on October 10, 2016. “Improving Timely Communication of Diagnostic Tests through Increased Patient-Engagement via MyChart” was presented by Dr. Rajiv Chandawarkar on April 26, 2017. “Increasing the Efficiency of Nursing Documentation While Avoiding Unsafe “Copy Forward Workarounds”” was presented by Dr. Emily Patterson on April 26, 2017. “Feasibility of Collecting Objective Measures During Transitional Care of Depressed Adolescents to Improve Patient Safety” was presented by Dr. Barbara Gracious on April 26, 2017. 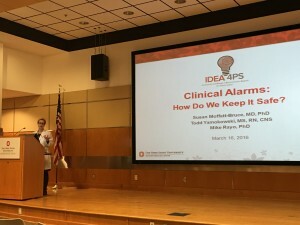 “Alarms and Clinical Monitoring: An Institutional Update” was presented by Ms. Jackie Lamendola and Dr. Mike Rayo on October 30, 2017.